A Design Contest for the Anacostia Waterfront? Those bright blue dots are making the future of Minneapolis look pretty darn nice. "Active and abandoned industrial sites, rail lines, a commercial port, and a highway... physically and psychologically separated from the lives of most residents." Does that sound like a riverfront you know? Well, those words were actually written about the part of the Mississippi River that runs through Minneapolis, which is about to be remade into a sustainable ribbon of waterfront under a breathtaking plan by landscape architect Tom Leader. 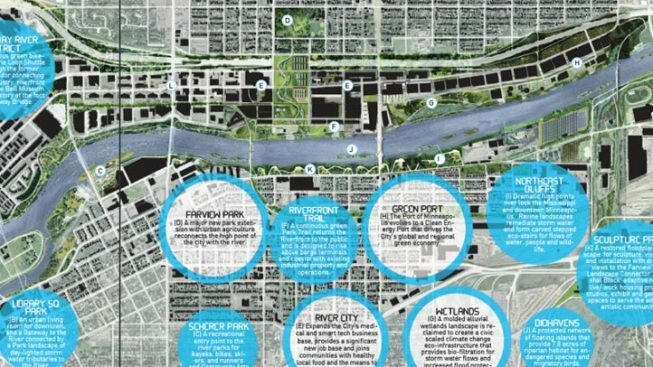 The vision, selected after a design competition sponsored by the Minneapolis Park and Recreation Board, is for a series of people-and-animal-friendly ecosystems covering a 5.5-mile stretch, which will be phased in over a period of 40 years. It's an inspiringly comprehensive approach for a problem that could otherwise be tackled piecemeal or not at all. Can you imagine what a world-class landscape architect could come up with for the Anacostia waterfront? Yards Park is a start, but the east side of the river -- Anacostia Park -- is essentially a blank slate (and the latest sketch of Poplar Point is nothing special). Sadly, it's also owned by the National Park Service, so D.C.'s ability to execute an exciting reconception is severely limited. Still, if Vince Gray wanted to put some pretty images to his One City words, this would be a good way to start. A Design Contest for the Anacostia Waterfront? was originally published by Washington City Paper on March 31, 2011.